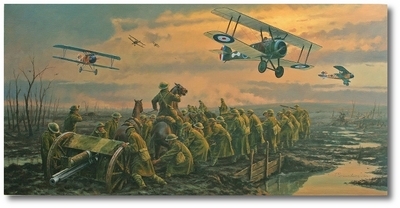 Canvas Edition Size (stretched): 42" x 21"
Swamped by mud amidst a desolate, shattered landscape, men and horses of the Royal Field Artillery drag their 18 pounder field-gun towards a new position on 15 November 1917, during the final days of the Battle of Passchendaele. 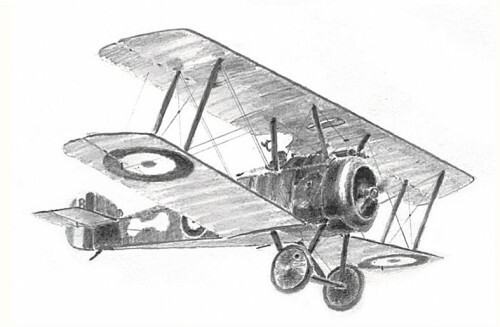 While the army continues its grim fight on the ground, overhead Sopwith Camels from 45 Squadron Royal Flying Corps tangle in an equally deadly duel with German Albatros fighters of Jasta 6. 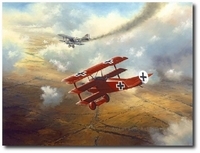 Flying the lead Sopwith Camel is the RFC Ace, 2nd Lt Kenneth Montgomery who scored the last of his 12 victories in this dogfight when he shot down the German Ace Leutnant Hans Ritter von Adam, the Commanding Officer of Jasta 6 with an impressive 21 victories to his name. To commemorate one of the most significant anniversaries in history, Anthony Saunders has created a powerful new painting portraying the bleak sacrifice made by so many heroic young men. The names of the bitter battles they endured, however, still live on a hundred years later � Ypres, the Somme, Vimy Ridge, Arras, Loos � and one of the most savage � Passchendaele.